Seventeen days have quickly come and gone. I’m back home in the U.S. now and I decided to write one more post to close out my blog. This was the first time I’ve studied abroad and I enjoyed it even more than I thought I would. Truthfully, I was hesitant about going to Japan by myself, especially post 3/11 and the nuclear scare. But, I am so glad that I did. I met an amazing group of students from around the world. I not only learned a lot academically, but socially and culturally as well. Discussing colloquialisms, what people eat, national customs, universities, etc. was fascinating. There were also the inside-jokes about Mt. Fuji, love hotels, Parm, awkward palm trees, and cement factories that still make me smile just thinking about them. I don’t think I can adequately explain how much I will miss everyone and learning and exploring with them. Also, the Todai students that I got to meet made my experience even more special. And in case any of them happen to read this, I would like to say thank you so much for everything you did for us! So as a final count, after two and a half crazy, wonderful weeks, I have 5,024 photos (~20GB of memory)! But even without the photos, the memories I have of IARU GSP – Sustainable Urban Management 2011 will stay with me forever! There’s been so much happening lately, I’ve been falling behind on blogging. So this post will be a condensed recap of the last week and a reflection about my time in Tokyo. One thing I don’t quite understand about popular Japanese culture is the playing of pachinko. They look like arcades for adults! And they’re everywhere (but not quite as common as vending machines, haha). It is loud and flashy inside and I’ve been told that smoking is obligatory when playing, which brings me to my next point. After being in Tokyo for two weeks, the only thing I can think of that I don’t really like about Tokyo is the fact that it is fine to smoke indoors. Smoking also seems much more common here than in California. It’s unpleasant eating in a restaurant and being surrounded by people puffing away. Even when there are designated smoking/non-smoking areas, they are usually only separated by a partition that doesn’t reach the ceiling or has a wide-open doorway. Even though weather reports have predicted rain and thunderstorms for almost everyday, I’ve been pretty lucky. I’ve only been caught in the rain twice. However, I might prefer rain to the intense sun and humidity that I’ve been experiencing. The other GSP people and I visited the Ikebukuro Bosaikan Life Safety Training Center. We learned about fire safety, attempted a fire extinguish and evacuation simulation, and most notably, experienced an earthquake simulation of the 1995 Kobe earthquake. I’ve only felt very tiny, short earthquakes while living in the California Bay Area. I can hardly imagine living in a place like Japan that experiences such long, intense earthquakes and so often. I'm sure Berkeley can learn a thing or two about earthquake safety from Japan. All 8 GSPers visited the Tokyo Tower (which reminds me of the Eiffel Tower). The view from the main observatory (150m up) and special observatory (250m up) is really pretty. An incredible fact I learned about Tokyo Tower was that during the March 11 earthquake, the tip of the tower bent, which can still be seen today. The Tokyo Metropolitan Government Building/City Hall has an amazing view from the 45th floor and it’s free to visit. The surrounding city looks so small and compact. The view is especially nice at night with all of the building lights on and cars zooming by. Since I’ve been in Japan, I always take notice of the size and shape of cars. Besides driving on the opposite side that I’m use to, their vans and trucks are tiny and boxy. They are very cute and compact! I got to see some of these vehicles at the Toyota Mega Web showroom and drive in a safety simulator. In addition, Odaiba has a replica of the Statue of Liberty. It took me by surprise being in Japan and see a massive, classic American symbol in the skyline. On the last day of class, we all had to give a presentation on a case study we were given about city flooding and its levee systems. Listening to other groups’ ideas was eye opening. It also made me think about how every action has positives/negatives and there are many aspects that need to be weighed before making any decision. I’ve learned a lot in my Sustainable Urban Management course. I can definitely say that I will leave Japan with a greater and broader understanding of sustainability, city management, architecture, and Japanese culture. I’ve been to the Disneyland in Anaheim, California, but I still went to Tokyo Disneyland, and I’m glad I did. I believe the park in Tokyo is smaller, but most lines weren’t incredibly long and the weather was nice. I felt like a kid again! It took me two weeks, but I finally ate sushi on my 14th day in Japan. It was really delicious and beautifully presented. We got to watch the person make it right in front of us. Today, the new students for the Japanese language and Nanoscience courses arrived. We were all taken on a tour around Tokyo. I can say with complete confidence that the food we ate for lunch was the best food I’ve had in Japan. It was also quite entertaining to watch it being cooked right at our table. I believe it is called "monja." At night, we attended a nice Welcome (and Farewell) Party for all IARU GSP students and faculty. Tomorrow is the last day for the GSP Sustainable course students. I can’t believe that it is already ending. I feel like I’ve been here forever and experienced so much, but at the same time, I’m surprised the program is ending so soon. I would really like to spend at least another week in Japan. 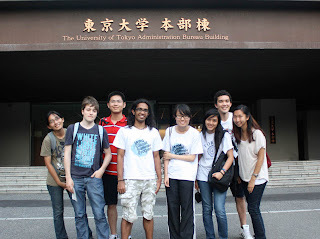 The people I’ve met, both GSP and Todai students, have been extraordinary. I feel incredibly lucky to have been given the chance to come to Japan and become friends with this amazing, diverse group of people. It’s sad to think that we will soon be scattering across the globe, back to our home countries. I will take many great memories and photos back with me to Berkeley! Lately, class has only been 1.5 hours a day, which is really nice. It’s like being on vacation (or “holiday,” as other people refer to it). Although the classes are informative and the professors are undoubtedly very knowledgeable, honestly, some of the professors are hard to understand at times. Some professors’ English speaking skills are better than others, which require a little extra attention to decipher what is being said. But overall, it has not been much of a problem. Outside of class, it has been a lot of fun! When off exploring Tokyo and beyond with the other GSP students, the people we meet are always very helpful with directions and patient/accommodating with us non-Japanese speaking people. During the pass three days, I have done so much that it is hard to keep straight what I did when. I have also gone photo crazy and have taken 1,122 photos since I have been in Tokyo (4.5 days). Classes have been interesting and have covered an array of topics including city regeneration, waste management, urban water systems, and sustainable building materials. During one lecture, the class worked in groups to create a SWOT analysis of a city. It was a fun and entertaining experience interacting with one another and exchanging ideas. Sticking to free attractions and walking where we can, each day is extremely tiring. I can’t remember the last time I’ve done this much continuous exercising. Plus, the temperature in Tokyo has been in the 80s-90s (°F). As if that wasn’t uncomfortable enough, the air is humid. In addition, it was predicted to rain and have thunderstorms in Tokyo throughout the week. Luckily, there hasn’t been either, except for very brief light drizzling. Also, after the earthquake and tsunami back in March, many of the electric signs, billboards, and buildings that are usually lit up are kept dark to save energy, making for a less electrifying experience (haha, pun!). Four days down, thirteen to go. I’ve only finished the first day and I feel like I’ve been here for at least a week already. Exploring during the day and attending class in the evening is tiring and strange. The Sustainable Urban Management course only has 8 IARU GSP students. Of the ten universities eligible to participate in this program, we have a mix from Australian National University, National University of Singapore, Peking University, UC Berkeley, and University of Copenhagen, with myself being the only American. Others measure temperature (the weather) in Celsius. People drive on the opposite side of the road. I was looking at a car passing by and looked into the driver’s window, but saw only an empty seat. After a couple seconds of confusion and fear, I realized the driver was sitting on the right side of the vehicle, haha. Many people ride bikes for transportation around the city. Americans (college students) are perceived as drunken, party people. School uniforms in Japan are normal. The end of June in Japan is their rainy season. Some subway/metro stations have gates or glass walls between the standing platform and the train tracks. Japanese people are notorious for being punctual. UC Berkeley is known internationally and regarded as an excellent school. Today was packed full of activities. During the tour around the Hongo campus of UT ("Todai"), I was surprised how green the campus was. There are trees everywhere and a beautiful lake within the campus. Their library had everyone in awe, and it made me realize that I’ve never truly appreciated the grandness of Cal’s Doe Library. In the Ueno district, there is so much to see, from shops, to shrines, to the Ueno Park. The first day of class was interesting and reminded me of my high school AP Environmental Science class. Even more interesting was the seating/desk set-up. It was unlike anything I have ever seen. The first thing that came to mind was the U.S.’s obesity rate and how these desks would pose a problem. After class, there was a “party” for exchange students held by the UT IRIS club. Also, here’s an entertaining tidbit for those who go to Cal – there is a Japanese drink called “Calpis,” hehe.